UK car maker MG Rover has gone into administration but Prime Minister Tony Blair has insisted a rescue deal with a Chinese investor is still possible. Mr Blair said he had contacted Chinese officials on Friday and hoped a new deal could be put together. Talks with Shanghai Automotive Industry Corp (SAIC) failed on Thursday, putting the future of MG Rover's Longbridge plant and 6,000 workers at risk. Administrators said some potential buyers had already expressed interest. The comments of the Prime Minister came after he and Chancellor Gordon Brown attended a meeting in Birmingham to discuss the crisis at MG Rover. "We will do whatever we can possibly do to safeguard the livelihoods and jobs of the people here," said Mr Blair. "We have got to just roll our sleeves up and get on with keeping as much production, as many jobs as we can, and we'll do that." Earlier, the government said a £40m support package had been put in place for the many firms in the area that supply MG Rover. Ian Powell, an administrator with accountants PwC, said MG Rover would continue in business over the weekend and staff had been asked to return to work next week. "We will be working closely with management, staff, unions, key suppliers, creditors and the government as the situation develops," he said. "We have been approached by a certain number of people [about MG Rover] and we would be delighted to hear from more people." Friday also saw John Towers, chairman of MG Rover owner Phoenix Venture Holdings, return from the failed talks with SAIC in China. He said he still believed there was a future for MG Rover. "I don't want to build up hopes too dramatically. But we've got options here I think," said Mr Towers. Yet with parts suppliers pulling credit and production stopped, industry analysts say the car maker is hanging by a thread. One worker said staff had been told the company could not afford to pay them beyond Monday. Workers said the redundancy terms on offer were £280 for each year's service, up to a maximum of 12 years. "We have worked here and that's it - that's all we're getting. Everyone was angry like anything," said 28-year-old worker Adam Barnes. "It feels terrible," added Ashley Wilkes, 43. 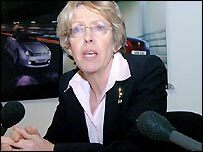 In the morning, Trade & Industry Secretary Patricia Hewitt had held talks with workers at MG Rover's Longbridge plant in Birmingham. She pledged to do "absolutely everything" she could to help them. 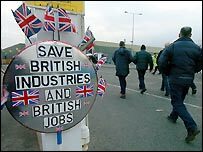 Ms Hewitt pledged to help workers but is MG Rover a going concern? A Rover taskforce has been set up and its members, who include the leaders of regional development agency Advantage West Midlands and business group the CBI, will meet on Monday. Tony Woodley of the T&G union said he had met the administrator, who "acknowledges that the priority for all of us is to explore every possibility of maintaining Longbridge as a going concern". He said no decisions about the workforce's future would be made on Friday. Ms Hewitt said the government had made the £40m package available to MG Rover's suppliers to help them "find new business and secure their future". An estimated 15,000-20,000 jobs in the area are supported by business from Longbridge. She said some firms had already begun laying off workers. Sited in an area of several marginal seats, the fate of MG Rover could also become an election issue, say correspondents. But none of the major political parties has said the government should have put together the cash for a massive bailout. For days, the government had been in intensive talks with both MG Rover and potential investor Shanghai Automotive Industry Corp (SAIC) to try to secure the firm's future. A bridging loan was on offer, but only for a year and a limited sum - whereas SAIC would complete the deal only if MG Rover's solvency was guaranteed for two years. Early on Friday John Towers, the chairman of Phoenix Venture Holdings - the consortium that bought MG Rover from BMW for £10 in 2000 - left Shanghai after the talks broke down, to return to London. The day before, Rover - the last UK-owned volume car maker - had had to stop production as the supply of parts dried up. "Yet again I'm having to write an obituary for another stalwart of the British engineering and manufacturing industry," said Tony Murphy of the Amicus union. "Longbridge and the whole of the West Midlands are becoming ghost towns." "We are going to fight for every job possible at Longbridge," said a spokesman for the T&G union. "We don't want to see another supermarket built." What next for Rover owners?